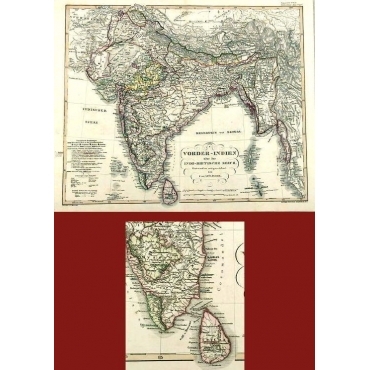 Antique maps India and Ceylon (Sri Lanka). India and Ceylon are part of Southern Asia. 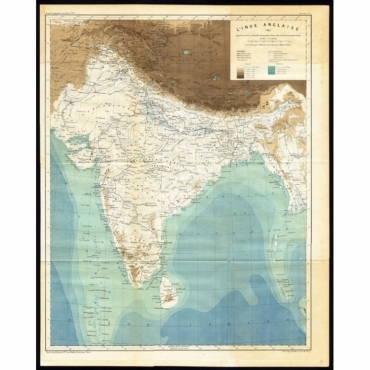 Our collection includes antique maps of India and antique maps of Ceylon by Mallet, Tardieu, Tirion and many other artists and engravers. Antieke kaarten van India en Ceylon (Sri Lanka). 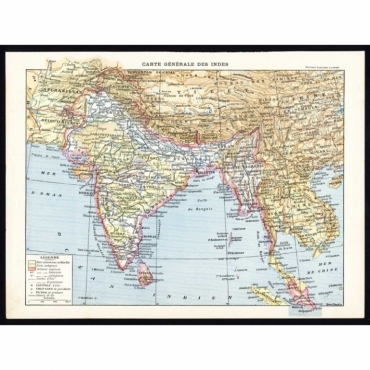 India en Ceylon liggen in Zuid-Azië. 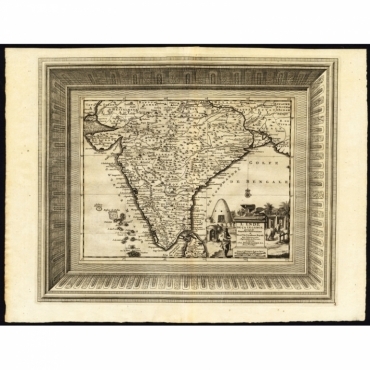 In onze collectie vindt u antieke kaarten van India en antieke kaarten van Ceylon gemaakt door Mallet, Tardieu, Tirion en andere cartografen. 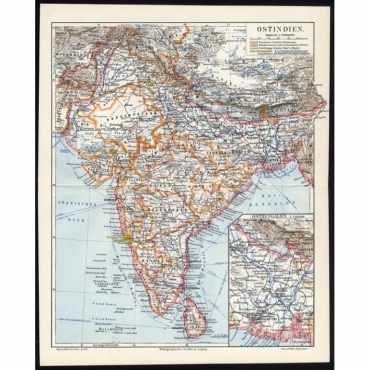 Antique Maps | India & Ceylon There are 73 products. 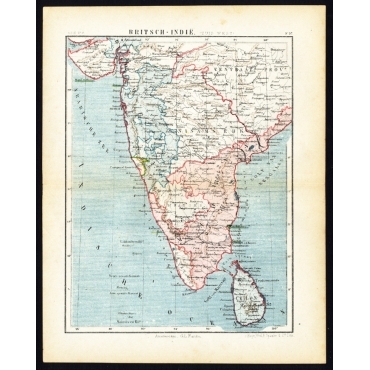 Map: 'Carte de la partie inferieure de l'Inde en deca du Gange, contenant l'Isle de Ceylan, les Cotes de Malabar et de Coromandel ...' (Map of the southern part of India with Ceylon / Sri Lanka and the coasts of Malabar and Coromandel). 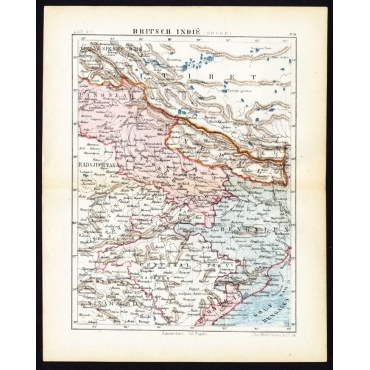 Map: Hindoostan or India. This map shows: India, Nepal, Bangladesh, China, Thibet, Tibet, Bootan, Bhutan, Asram, Meckley, Burmah, Aracan, Pegu, Myanmar, Meghalaya, Ceylon an d Shri Lanka. Map: 'L' Inde de ca le Gange suivant les nouvelles observations ..'. (Map of India.) Detailed map of India, with part of Sri Lanka. Compass rose and decorative cartouche lower right with scale and elephants. Map: 'Nieuwe Kaart van t Keyzer Ryk Grooten Mogol.' 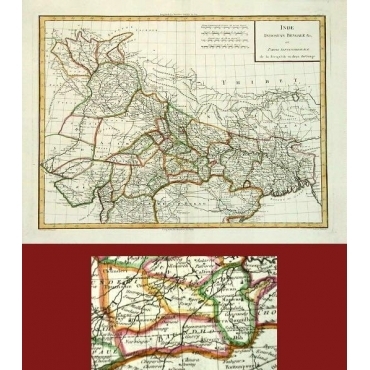 (New Map of the Mughal Empire). With compass rose and scale. Map: 'Nieuwe Kaart van t Eiland Ceilon.' (New Map of the island of Ceylon / Sri Lanka). With compass rose and scale. Plate 57 : 'Britsch-Indie, Zuid-west.' (British Indies, Southwest). Plate 56 : 'Britsch-Indie, Noord.' (British Indies, North). Plate 55 : 'Britsch-Indie, Oost.' (British Indies, East). Plate: Calcutta et ses environs. 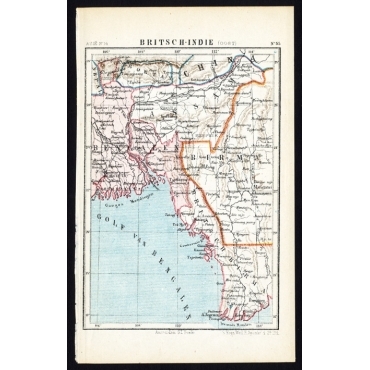 This map shows a part of India in specific the surroundings of Calcutta and Calcutta itself. Plate: Kachmir. This plate shows the Indian State of Jammu and Kashmir including the capital Srinagar. Plate: L'Inde Anglaise 1882 - d'apres le texte de la Nouvelle Geographie Universelle et d'autres documents recents' (Map of the English Indies in 1882). Present day India, Pakistan, Sri Lanka. Map: 'Het Koninkryk van Bengale en de Vloeden die zig inde Ganges ontlasten (â€¦). / Royaume de Bengale (â€¦).' (The Kingdom of Bengal and the floods that evaporate in the Ganges river.) Extremely rare in this edition. Map: 'Le Golfe de Cambaye at la Rade de Suratt.' (The gulf of Cambay and the coast of Surat, India.) The Gulf of Khambhat, formerly known as the Gulf of Cambay, is an inlet of the Arabian Sea along the west coast of India, in the state of Gujarat. Extremely rare in this edition. Map: 'Ostindien.' (Map of India with an inset map of East-Bengal.) We carry slightly different maps from different editions. Please inquire. Rare Map: 'Presqu'Isle de l'Inde deca la Gange, ou sont les Royaumes, de Decan, de Golconde, de Bisnagar, et le Malabar' par N. Sanson d'Abbeville Geographe ordinaire du Roy.' (Map of Southern India). Striking map of southern India, with a portion of Sri Lanka shown as well as a bit of the Maldives. 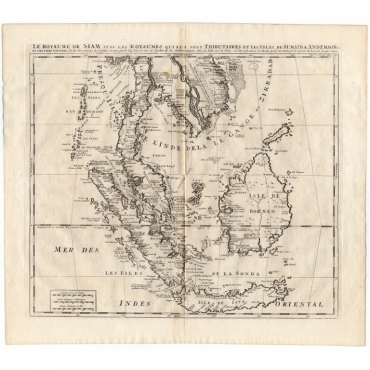 Original antique map, titled 'La Royaume de Siam avec les Royaumes qui luy sont Tributaires et les Isles de Sumatra Andemaon'. It shows: South-East Asia; Borneo, Java, Siam (Thailand), Malacca (Malaysia) and Cochinchina (Vietnam). Antique print, titled: 'Bay de Trinquemale.' - A map of Trincomalee and Tambalagam Bay in Sri Lanka. 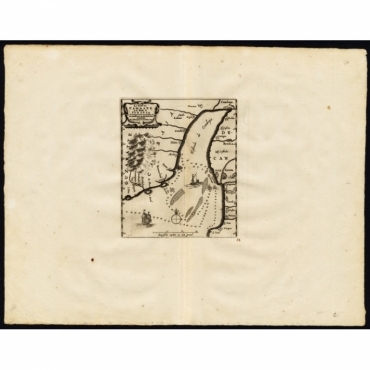 Antique map, titled: 'Nieuwe kaart van Choromandel ende Malabar.' 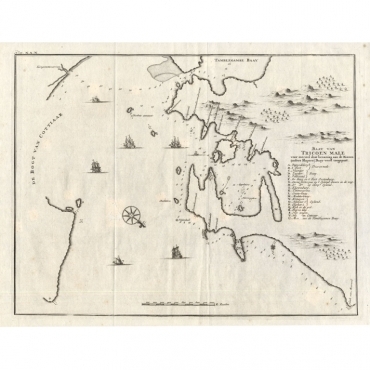 - This is a New map of the Coromandel and Malabar coasts. This is the southern part of India (Kerala, Tamil Nadu and the northern edge of Sri Lanka).